Exploring Modern Masculinity and Yoga is a three-hour workshop that offers men a reprieve from performance, competition and ego. It’s an opportunity for men to come together and explore modern masculinity and connection — within ourselves, with other men and, ultimately, within the other relationships in our lives. This workshop is an opportunity for men to destigmatize emotional expression and vulnerability, and to embrace strength through intimacy and connection. No formal yoga experience or training is required. A willingness to engage in group discussions, share something of your experience and insights, and allow others space to do the same is all that is asked. Wear or bring clothing to change to that is comfortable for movement. An asana practice, the physical practice (poses) of yoga, will be part of this workshop. Bring a notebook and pen, and a water bottle. All other items (e.g. yoga mat) are available at Root for your use. Adam Williams is the workshop facilitator and yoga teacher for Exploring Modern Masculinity and Yoga. 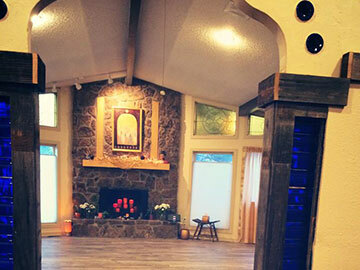 He teaches yoga classes weekly at Root Center for Yoga and Sacred Studies. Adam’s work as a teacher, a writer and creator of Humanitou focuses on connection and authenticity. You can read more of his approach to this work at Humanitou Yoga. Register online using the “Purchase Pass” link below. Then keep an eye out for an introductory email to arrive from Adam a few weeks prior to the workshop. If you have questions, email adam @ humanitou.co.